Slow Food San Diego launched this amazing project and continues its support. For the past two years Slow Food San Diego has been supporting the San Pasqual Academy, a residential and education option for foster teens. Benefit proceeds from Slow Food’s 2005 annual fundraiser launched a one-acre student sustainable farm. 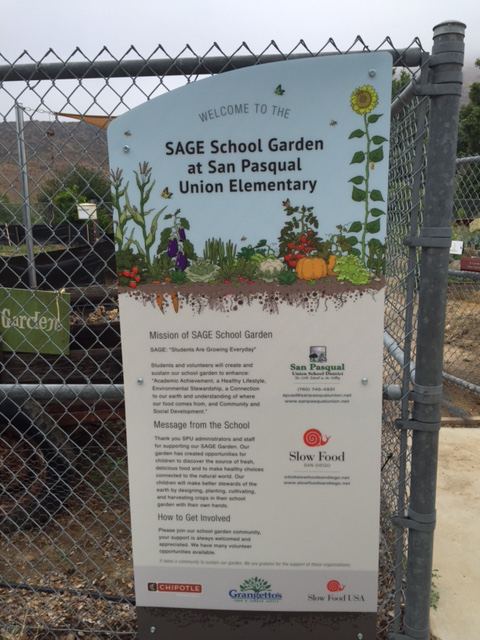 Located on the academy grounds, the project is part of the agricultural program headed by farmer and teacher, Scott Murray, Slow Food San Diego board member. Slow Food funds were matched by various other local donors. The project is expected to expand to 120 acres and ultimately hopes to supply local area restaurants. The 2006 August fundraiser helped further that goal with the addition of four interns from South America . In June 2006, Heritage Foods USA delivered two severely endangered red wattle pigs for the teens to raise. Slow Food San Diego is committed to awakening young people to the enjoyment and health benefits of wholesome food. The sustainable farm is successfully teaching teens about ecologically sound food production while giving them a sense of positive accomplishment through land stewardship. The field day at the farm was a great success.